This recipe, handed down to me by a friend in the form of index cards, was originally from the beloved Joy of Cooking. 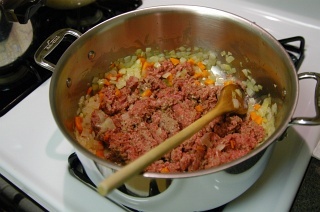 Reduce the heat to medium-low and cook, stirring occasionally, until tender, about fifteen minutes. This is a good time to preheat your oven to 400°F. I'm not familiar with US varieties of potato, and it was difficult to tell from the photograph - is the russet potato a waxy or floury potato? 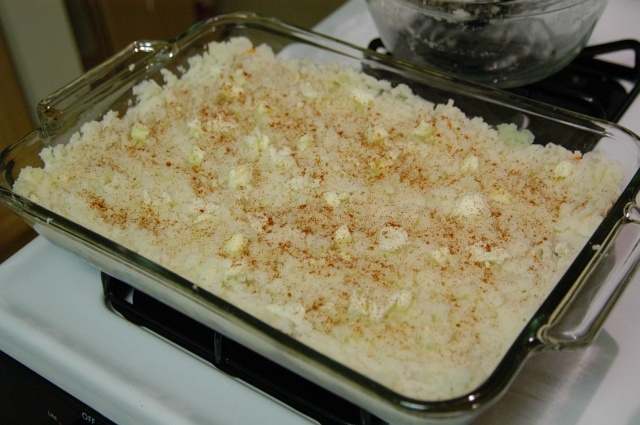 The mashed potatoes didn't look quite as smooth as we would use in Britain for a Shepherd's Pie - we would use quite a bit more butter, and milk rather than water, to give a thick, smooth pur�e. I should have written that Shepherd's Pie is often made from the leftovers from a joint of [u:cdc5743c13]meat[/u:cdc5743c13] (not just beef - lamb is probably more often used). Subject: Who hasn't tried it? Since the potatoes are already mashed and warm, and the meat and vegetable portion of the dish are already fully cooked, and still hot from the range top, what do you lose by not simply broiling the dish for a few minutes, instead of a 400� oven for thirty minutes? It seems to me that you could save some time doing that, as well as perhaps saving some moisture in the lower strata of potatoes by not exposing it to the heat for so long. Otherwise a nice recipe, and as this is my first comment, let me congratulate you on an excellent website. If this website did not exist, mankind would be driven to create it. Great website. I added 1/4 cup very dry sherry to the mixture while it was still cooking. It added a nutty flavor. I also used pork, as that was what was leftover. I agree with the worschester sauce addition into the gravy...it brings out more flavor, along with 2-3 tbsp tomato paste. I also add a layer of cheddar to the top that melts down onto the potatoes. I did use someone's recommendation and set it under the broiler instead of baking it. I prepared the potatoes after the meat mixture, so they were still warm. Broiled it a few minutes until the top was golden, then sprinkled a touch of sharp cheddar and returned to the turned off, but still warm oven to let it melt. This is exactly how my husband likes it, so he was thrilled. Thanks again for a wonderful site, I have tried 4 recipes here already and they have all been a big hit with the family. Thank you, Michael!! A recipe from Sunset magazine that I found sveral years ago was a nice variation on the traditional. They added sweet potatoes to the mashed potato topping ( aboout 50/50 red garnet sweet potatoes / russett potatoes). The meat filling was the same ground lamb and veggies, but spiced with a mild curry. IMHO a very tasty change of pace. 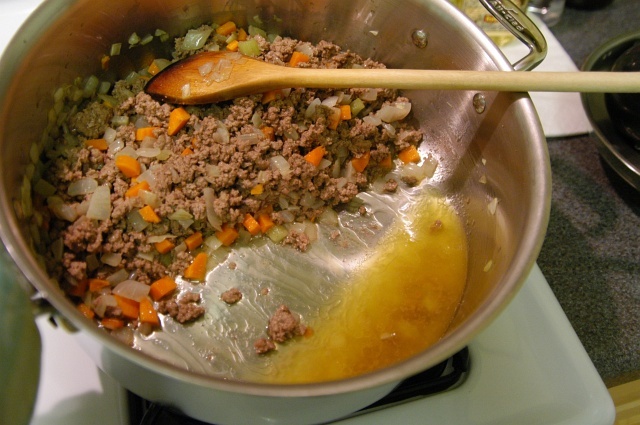 Great recipe for shepherd's pie or cottage pie, depending on the ingredients! Thanks. I tried a variation that others might like to experiment with. I used country sausage (pork sausage w/a light onion/garlic flavor and minimal sage) in lieu of the beef/lamb. Instead of beef stock for gravy I used some excellent turkey stock made with herbs d'provence. The stock is a little stronger that chicken stock and not as heavily flavored as beef stock. The results were very good. I also added the layer of peas. Subject: How many pounds of potatoes? In your spiffy charts, you show 1.5 lbs of potatoes for the mashed potatoes section. In the assembly chart, you show 1.75 lbs. I just wanted to ask where the extra .25 lbs of potatoes snuck in from. Subject: Re: How many pounds of potatoes? 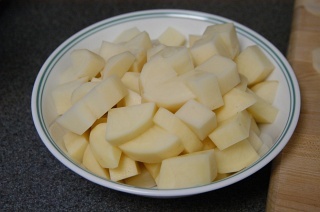 Extra water cooked into and then mashed into the potatoes makes mashed potatoes weigh more than the starting potatoes. I would concur with both the Worcester sauce and tomato puree additions, but only when using lamb. If you are using beef, then it has to be Marmite. As for the potatoes, I've achieved my best results by steaming them, then mashing with a positively indecent amount of unsalted butter and a little double cream. Season with a good sea salt and white pepper. In our household, peas are usually served separately. As an aside, the devil's vegetable (sweetcorn) should only ever be eaten on the cob, in tuna sandwiches or in a smoked fish chowder. Since this recipe is taken directly from the Joy of Cooking (and the recipe description is copied verbatim), I think it would be good practice to credit the publication. The presentation is unique, but obviously people think that this is your recipe. Oh, nice. I when I wrote this I did it from note cards and didn't know if I had gotten it handed down through friends or from a cookbook. Even the presentation notes are the same - fluffing the potatoes in a baking dish. Only thing that got added over the years appararently, was the paprika. Interesting, how some recipes evolve quickly, and some just stay the same as they change hands. I've added a credit statement at the beginning of the article. are the rosemary and thyme necessary for this recipe? Just tried the pie -- fabulous! Had some leftover gravy from a pot roast that I used instead of beef broth, added chopped fresh parsley (about 1/2 a bunch) in with the ground beef, and a few splashes of sherry right at the end. Put plenty of butter in the potatoes and used milk instead of potato water - I used unpeeled red potatos, like I always do - saves on peeling them and then there's all the nutrition in the peels not thrown away. I like to add parsley to most dishes - gives you an inexpensive and easy way to add that dark leafy green veg. we all need without adding any discernible flavor - go ahead & use the edible stems and just chop very fine before adding. A little trick for making sure your boiled potatoes are completely dry before mashing them: After draining, return the potatoes to the stove and dry-cook for a few minutes - this ensures there's no extra water left in the pot which can make them taste -- watery of course! Then mash in your butter thoroughly before adding the milk. This way each particle of potato is encapsulated in butter before adding the milk. Make sure you use enough salt & pepper and you'll end up with creamy, buttery potatos. This is for the person wanting a cheap source for rosemary & thyme: Instead of buying the expensive brands in the spice section, look for the Hispanic spice display, which is usually close to the regular spices or in the Hispanic food section. You'll find most of your common spices at a much cheaper price - around $1.00 for a 4 to 6 oz. bag of thyme, bay leaves, rosemary, black pepper, etc. Traditional French-Canadian recipe uses no carrot/celery and definetely has corn. Yes this is P�t� Chinois here. I have always seen it made from ground beef in my lifetime here. Depending on the cook, sometimes the corn is mixed into the beef. I like to layer the corn between the beef and potatoes, giving (at least the illusion) that the beef fat will not seep into the potatoes the way it is meant to do in a tourtiere crust. (I know you remove the excess fat anyway in the recipe). These days, I also do it with extra-lean beef, that I don't remember if it existed 40 years ago. I don't think my mother used that much broth or liquid, probably to accelerate the preparation - this was the fast and plentyful meal for the starving masses coming home from school. Sort of like the occasional alternative to meatloaf. For the people who haven't found the patience to brown the top layer of mashed potatoes, less liquid would also facilitate 'drying' the top - it will not brown easily if humidity is still evaporating from the bottom layer, thereby keeping the potatoes moist. 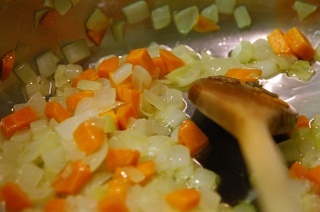 Make sure to thicken (French term is reduire like reduce) the liquid. Also, I have always seen it with plain corn rather than cream of corn, which would add calories, and yet again more liquid to the recipe. As for the tomato paste, people here normally add ketchup liberally over the dish once served in their plate, rather than adding it to the dish. It's not like I'm trying to tenderize the beef with (acidic) tomato while cooking. Similarly, I withhold salt in the dish, because of the large amount contained in the ketchup that will be poured over later. I normally use more pepper and less salt, to every dish that contains ground beef and ketchup in the plate. My family has apparently "butchered" this recipe a long time ago. 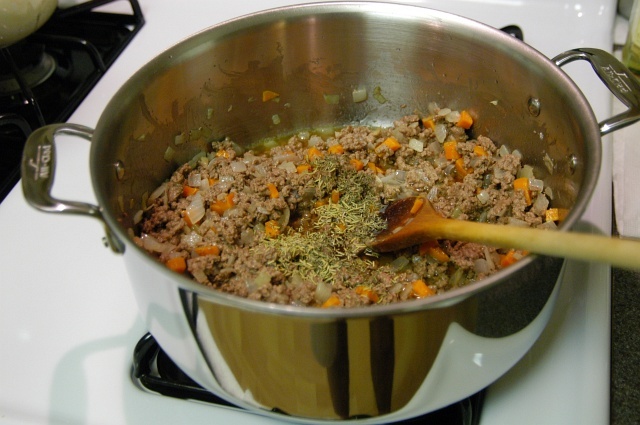 As a child (and even now) we do not make a gravy with the ground meat. We saute the onions, brown the meat with the onions then layer meat, peas, cream corn, whipped potatoes. I think the intent was for the cream corn to mimic the gravy. I do have to say that it is still my favorite meal. Nearly the same recipe I use, but I also like to bake a thin (1/4") cornbread crust in the bottom of the casserole prior to loading in the rest of the ingredients. It adds a nice texture and helps keep the filling in place when transferring to a serving plate. Other 'boredom variations' have included 1/2 cup of sour cream and 1/4 cup dry white wine with 1 tsp cracked pepper in the meat gravy or 1/4 cup chopped fresh cilantro added between the meat mixture and potatoes. These tips and tricks all sound wonderful! I had forgotten about this dish for many years. I had it while growing up but never prepared it myself. I tasted it again while traveling through the Yukon and it brought back great memories. I want to start making it for my family too. Thank you for all of the ideas. The kids will love it! I'd made Shepherd's pie this morning for the freezer, then discovered a link to this site - it's great! With the emphasis on increasing the amount of vegetables we eat, I stuffed my 2lb meat mix with 2 big onions, 3 medium carrots, 1 red pepper, 1 yellow pepper, and a mug of peas. All the veg exept the peas chopped. I never thicken the gravy, but add just enough stock to come to about an inch below the top of the meat. Steaming the spuds and then ricing them before adding butter and seasoning gets them really fluffy. (A ricer is like a huge garlic press.) Don't stint on the butter (but olive oil can be substituted) as it aids the topping to get beautifully golden. A few bruised cloves of garlic, bay leaves, fresh woody herbs like thyme/rosemary can be cooked in with the meat and removed before assembling the pie. Oh yes - a heaped tsp of mild curry powder and plenty of worstershire sauce add zing and help cut down on the salt needed in the meat layer. Last night, I made Cottage Pie using Rachel Ray's Shepherd Pie recipe, except I used 1/2 pound ground pork and 1 pound ground beef. I also added 5 mushrooms. For the potatoes, I used a recipe of Martha Stewart's for Basil-Chive Red Potato Mash. Subject: Excellent site! Excellent recipe! Having just had your site sent on to me, I have to commend you on your presentation - pictures, well laid out ingredient and timeline cards. Nice. Good for those of us who recognize that the family gene for improvisational cooking skipped a generation with us! One variation I recall from my Scots mother's version of this is NOT mashing the potatoes, but ricing them (using a potato ricer) onto the top of the filling. I found that this added a nice look (it is mostly aesthetic as I can think of no important functional difference) and a few minutes of broiling at the end (after some lower temp cooking) seemed to brown up the top really nice (another poster had suggested that earlier). If you want a different (and I think nicer) look to your pie (I won't touch the shepherds'/shepherd's/cottage dispute...), get a potato ricer and give me old mum's variant a try. Also, having done this with corn a few times, I prefer kernel corn to creamed corn, but our mileage (or kilometerage) may vary. 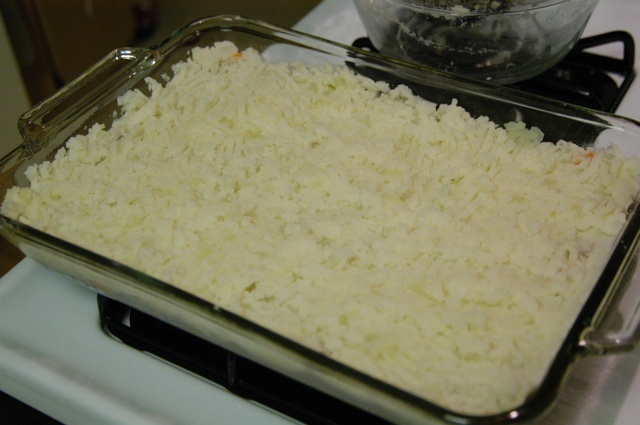 I neat thing with sheppards pie i saw last night was to use a plastic bag and cut one of the corners to make a rather large hole to pipe the mashed potatoes on top in peaks and it seemed to brown a lot more and make a better crust and make for great presentation. just something i saw and will try when i get the chance. This weekend my husband and I stopped in a local pub to have a quick bit to eat. He ordered a burger (of course) and I ordered the special, Shepard's Pie (it was made with beef). It was delicious! I couldn't eat it all so I got a doggie bag. The next day I decided to have it for lunch, my 17 year old son asked to try it and has been asking me to make it for dinner everyday since then. I have gone to my trusty recipe websites looking for a recipe but to no avail! I finally goggled Shepards' Pie and found this website! I love it! I will bookmark it for future use and I will defintely make Cottage Pie. I think I would prefer it with beef rather than lamb. The recipe and suggestions sound great and I will let you know how it turns out. A real hearty and tasty shepherds pie, contains the following! Chopped meat. Carrots. Sweet Peas. Sliced Onions (mushroom gravy, beef gravy)better taste and more juicy. salt and pepper. Mashed potatoes (MILK and butter), water is no good, milk makes it creamier. Do this and you'll find a winner! I did not have a baking dish, so instead I used some cupcake/muffin pans. I was able to make 12 individual serving pies from the recipe described above. However, they did not hold together very well upon serving. I love this website! And I love Shepherd's Pie! For those of you not counting calories, cook 4-5 slices of bacon until crispy, set aside and saute the veggies is the fat instead of the oil. I still remove the fat later on (before adding the flour). Crumble the bacon into the meat mixture at the end once they're cooled. Personally, I don't use celery. Essential: One pkg of mushrooms (quartered) sauted with the veggies and several handfuls of frozen peas at the very end. Worcestershire is a must, as well as a pinch of red pepper flakes. Final touch is liberal amount of sour cream into mashed potatoes and I triple the butter used in this recipe. No milk necessary. I've mixed in grated gruyere cheese to potatoes before too... sinful!! Interesting to see so many comments - I didn't realise this dish wasn't well known in the US. It tends to be a staple in England - it's cheap & quick & children love it. My family always used a layer of baked beans between meat & potatoes - drain the sauce from the beans and stir it into the meat with a dash of worcester sauce, instead of gravy. All sorts of tinned or left over veg can be used though, as other comments suggest. One of the great things about the basic idea is that you can vary it in so many ways - curried meat mix or sausage & tomatoes are both good with cheesy mash for example. You can also use a layer of sliced potatoes on top instead of mashing them, if you have waxy potatoes, or use celeriac, swede, sweet potato, kohlrabi or what you will. Incidentally the fish version, fisherman's pie, is usually made with a layer of sliced hard boiled eggs over the fish & white sauce. I just made this a couple of days ago. I followed the recipe almost exactly. I took the advice of others on the site and added some frozen peas/corn. This dish was delicious. I was eager to eat the leftovers the next day. I can't wait to make this again! I would like to suggest you try adding butternut squash to the mashed potato and sprinkle grated cheese on top, and regarding the cottage or shepherds pie debate my grandmother led me to believe that cottage pie was minced beef and potatoes (no pastry), and shepherds pie was minced lamb. Mine's still in the over. (Hey, love your site!) My (steamed) potatoes dried out a bit while I was cooking the rest, so rather than spreading them on, I just kind of broke them up with my hands. They are browning very nicely -- looks pretty. Also, my meat mixture ended up a little wet, so I thought it better not to moisten the potatoes. Also, I mixed a little cayenne with my paprika. Five to ten minutes to go. I'm hungry! Thanks, engineers! I ate Shepherd's Pie only when I was in boarding school at Albert College in Canada and it was different every time (we always used ketchup as a table condiment) because it was always made out of leftovers from the previous few days meals. The fish? Memories of Kedgiree! Mmmmmmm. Great website! I'm looking forward to trying the different variations and tips for this recipe. My sister and I once made something like this from scratch but deciding to indulge... we added sour cream to the potatos, put a layer of finely shredded cheddar on top of them and then a thin layer of french fried onions. The onions stayed crispy and it was really good and the next day it was even better. One question- What do you call it if it is made with a pastry? I would like to try that sometime. "made with a pastry" - not entirely sure I'm understanding the question, but a "deep dish thing" with a pastry top might be more aptly a "pot pie"
chicken pot pie is the "classic" but only a few zillion parallels exist. . . .
perhaps what distinguishes "cottage pie" from "pot pie" is indeed the use of mashed potato vs. pastry as a "lid"? Subject: Cottage (And/or Shepherds) pie. Firstly, I have been popping into this site for more than a year now and have never been disappointed by the contents. I personally like to mash my potatoes with grated mature cheddar cheese and nothing else for this recipe, it just seems to enhance the flavour of the rest of the dish. Also, I never boil potatoes without generously salting the water first, most of the salt is poured away with the water and the potatoes taste insipid without it. Lastly, I find that an egg, beaten with a little milk, painted over the mash with a pastry brush gives a wonderful, crispy, golden brown crust. I have also heard of people using breadcrumbs on the crust. I am still confused about the potatoes....I am from Mauritius and i am still unaware as to whether they are waxy or floury? Can someone please help me as to how big they should be accordingly. Here in Mauritius we have only got new potatoes. They are slighlty green and sweet. 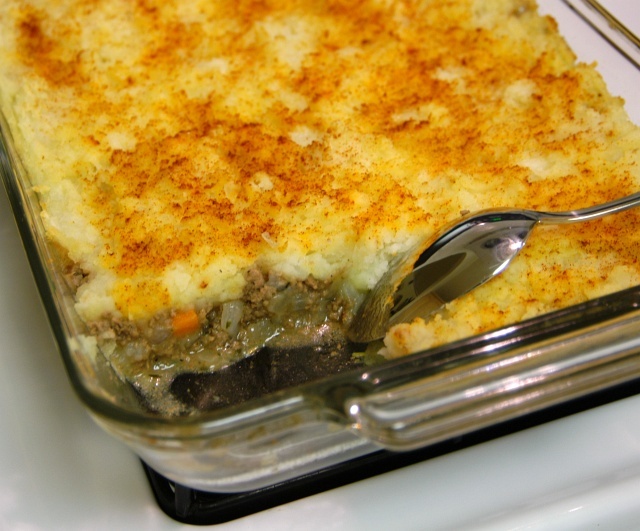 Shepard's Pie is a "dish" - a "concept" with multiple thousands of variations. it's a similar situation as "the only way to fry eggs is: . . . . "
the dish has so much history, I doubt there is "proof" that Recipe X is the one and only "authentic" method. . . .
mashed potatoes are a usual & customary "topping" to a savory "inside"
you'll see tasty looking mentions here of vegetables in with the meat - well, other than "seasoning stuff" i.e. celery, mushrooms, green/red peppers, onion, leeks, <whatever>.... I stick with ground beef browned to a slightly crisp stage. it's not "right", it's not "wrong", it's how my family likes it. so whatever works for you along the lines of making a mashed potato is what you go with <g> I prefer a mealy type (high starch) vs. waxy (low starch) for mashing - waxy types often mash to small chunks vs something smoother - but that is entirely personal preference. I used to have this all the time growing up in canada. I recently moved to the US and my husband has never heard of it! So, I'm making it for dinner this week and really looking forward to it. I do have one question though; There are only 2 of us and I know we'll have a lot of left overs and I would hate for any of it to go to waste. Is it possible to freeze it AFTER it's been cooked? there's just two of us's and this dish is not something you need to produce 400 pounds of in one go. toss a couple slices of garden ripe tomato on top. Hi Im a bit of a new cook and I was just wondering how to add frozen peas. Do I need to boil them first? and at what stage should I add them? Hope some experts can help me! Frozen peas are cooked already. If it's a "fresh" bag (i.e. the peas aren't frozen together into one clump), you can just add the peas directly to the recipe. Otherwise, you'll probably want to put them under running cold water to thaw and separate. If the peas are so old that they've started to dessicate (in the freezer ice can sublimate (like evaporation but going from solid to gas) and dry out the peas) then get a new bag. I have never heard of cottage pie and never tried it myself ever before. I found the recipe here in your site and very amazed of the easy step-by-step procedure and the outcome is just simply yummy! Thanks a lot for the recipe... oh and the other stuff I tried from here came out perfectly too like the cheesecake cupcake and the condensed milk chocolate fudge. Now the banana cake is in the oven hehehe! I love this site! Thank You! Can't wait to try to the other recipes! made this tonight for supper and....wow! it was AWESOME! i did reverse cook the lamb as it was still partially frozen , but it was great and my kids loved it. I love the variations discussed, and although I haven't the time to read all the comments, I hope I'm not mentioning something already added. I like to saute onions and keep them for the mashed potatoes as a change. Also I like to put a layer of corn in between the meat and the potatoes. 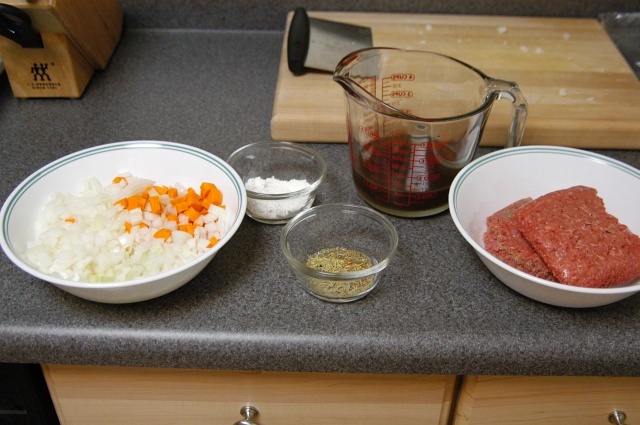 In the meat I sometimes add Diana Sauce (a Canadian condiment) and/or ketchup or BBQ sauce along with the Worcester Sauce! Yum! This is what I'm making for dinner tonight, in Beijing China! Regards, from Beijing! Loved the recipe, loved the way it was posted! I left the site up and my kids used it to make dinner. We like homegrown lamb, and add a little extra seasoning; like W-sauce & curry. thanks for introducing us to this new old standard! I love the classic Brit recipes - all real food, nothing processed, but still super simple. Thanks for sharing this one. I'm so over the "lowfat" thing; what's killing us is not (natural) fat, but processed food. So I put back the original milk & loads of butter, browned the veggies in bacon grease, and enjoyed my grassfed organic beef cottage pie. I also stirred in some leftover steak & kidney pie for good measure. Unfortunately, my first encounter with shepherd's pie was in a dorm at a university many years ago. I had no idea what it was. I would not even try it. The presentation was so horrible that it resembled meat loaf with a thick slab of fat on top of it - not lucious mashed potatoes. That says a lot for the quality of the food we had. It wasn't until one of my friends who happened to be a diatetic major worked in the cafeteria clued me in as to what the dish was supposed to be. I still could not try it - based on first impressions. I still haven't tried it in my home to this day. After reading the postings, I may just try it though. Sounds great now! I've been eating, as a child in England, and making, as an adult living in France, shepherd's pie regularly every two weeks or so. I stick in anything left over, vegetables and meat etc. I always chop up some onion and bacon and fry it before adding the meat. I make gravy by scraping the juices and adding Bisto or some other gravy thickening product and Worcester sauce. I sometimes put a layer of sliced fresh tomatoes under the potato pur�e. Served with green peas this has always been my very favourite dish, in spite of living in such a gastronomic country! You go, realfood. People need to get a clue about the crap that the food processors are selling under the cover of emotive, content free words and phrases like "low fat", "organic", and "healthy." The single best thing you can do for your health (in the absence of a serious illness or condition) is to learn to read the food labels and ingredients lists, and then read them (you can start with http://www.cfsan.fda.gov/~dms/foodlab.html -- not very good, but it's a start). Then pay attention, and eat everything--*everything*--in moderation. Your body needs fats, carbohydrates, oils, nuts, seeds, meat, eggs, etc.--in moderation. (You need the so-called "healthy" foods as well, but don't be fooled by the marketers, you need all foods.) Ignore the hucksters, use common sense, and enjoy your life and your food--in moderation. And by the way, great site Michael. Keep it up. If I had known about it, I would have used your link for my Amazon purchase this morning. Sorry, but it won't happen again. One can of Mary Kitchen roast beef hash. One two-serving portion of instant mashed potatoes. Layer potatoes over hash, bake until bubbling, then broil for color. Lazy, simple but darn good. I would brown the flour in a little oil before putting it in. This is how mountain brown flour gravy is made to avoid a pasty white flour taste. The taste is from not browning. In old times flour used to be roasted. I'm an Engineer. 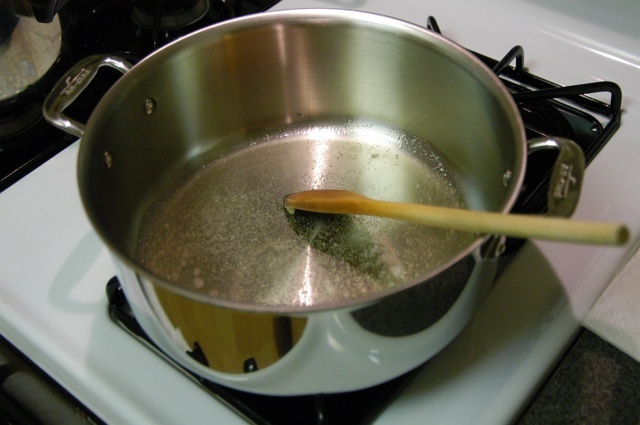 Put a tablespoon of oil in a pan. med heat, add flour. It can take several min for it to turn brown. It must turn brown. Not white. White gives you that nasty pasty lazy yankee white gravy taste. yuck. Learned this from my mountain folks relatives who lived on it in the great depression. We now live in Thailand and as my children wont eat much veg I steam a courgette or two in the microwave then mash in the food processor and mix in with the meat, I then add corn kernels and carrot (which they will eat) and they love it, this is a good way to get kids to eat veg, along with food which they do like, cottage pie being a favourite. 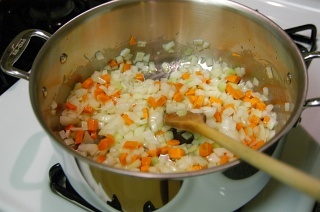 I like to use a slice or two of bacon with this dish and cook the vegetables (usually just onion) in the grease. Then brown the meat and put the crumbled bacon in with it before putting the mashed potatoes on top. I'll also generally use a bit of spaghetti sauce (or even pizza sauce, it depends on what we have left over) in lieu of gravy, and whatever leftover vegetables we might have (e.g. green beans or corn). Cooking the flour in oil ahead of time makes what's called a roux. It can take a while to brown and you need to keep a close eye on it, stirring it often, to make sure it doesn't burn. I like the roast beef hash idea. And yes, kids do love this dish. Thanks for the wonderful information. Our neighborhood is getting together on the 26th of September for an Iron Chef Shepherds' Pie cook off. There are going to be five or six different pie recipes. I will post the result after the contest. When I am feeling adventurous I make Mexican cottage pie by just turning the mince into a sort of chili and putting some plain cornchips on top of the mash. I've also done a stroganoff cottage pie by making a normal stroganoff but instead of beef pieces or strips I use beef mince. You just have to be careful not to make the mince too watery. The stroganoff cottage pie is probably the fave in my house. Any way to make that recipe flow chart thing printable? There should be a Link at the top right of each recipe article that says "Recipe Card". click it and it should be a printable version of the recipe table. I brown 2 lbs ground beef, add onion and garlic to season it, drain off the excess grease. Add can of corn, peas, green beans and sliced carrots to the pot. Add 1/4 cup sugar and a few splashes of Worchestershire sauce. Layer that mixture into a glass baking dish. Prepared box mashed potatoe flakes, spoon that over the top of your mixture. Sprinkle cheddar cheese on top of potatoes. Cover with tin foil. Pop in oven at 350 degrees for 45 minutes. 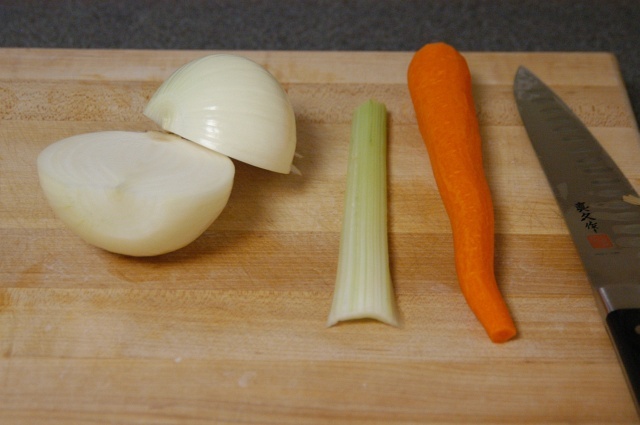 Great photos for anyone who hasn't cooked Shepherds Pie before. I am a british girl and also have a nice easy recipe for shepherds pie. No photos I am afraid but it is tasty and foolproof. These Meat Pies started out as the poor man's food in the British country side where potato was also a common part of the hardworking man's diet. 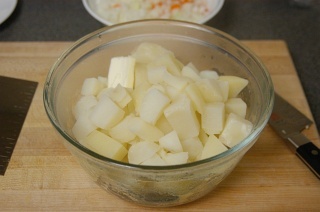 The ratio of the meat mixture to potato should be around 1:2. What most people don't know is a shepherd herds sheep. So it is more correct to say Shepherd's Pie if your meat base is mutton or lamb. Cottage Pie on the other hand is made from beef. With all else the same, these meat pies are very hearty and tasty. Here's an additional tidbit of information: Typically, the meat used in these pies were from leftover meat. Nowadays, it's easier to use ground meat instead. And even though these meat pies started out as the Poor Man's food, that is no longer the case. I've done this recipe in a cast iron skillet, cooking the meat and veggies, then tossing the potato mix right on top, then into the oven. I hate messing up extra pans. I Love anything with minced beef in it. 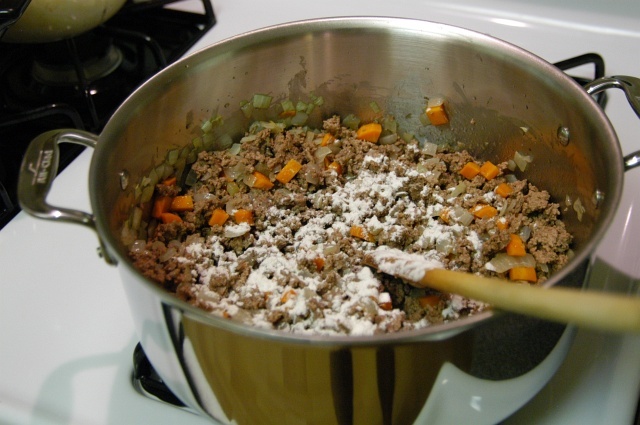 I'm getting on in years and find that most of the mince recipes are very simple :) . As far as Cottage Pie goes I agree with a lot of what has been said but would just like to add that in mine I always add frozen peas, Oxo cubes and Worcestershire Sauce, but only add a few drops of the sauce because you also need half a teaspoon of Marmite. 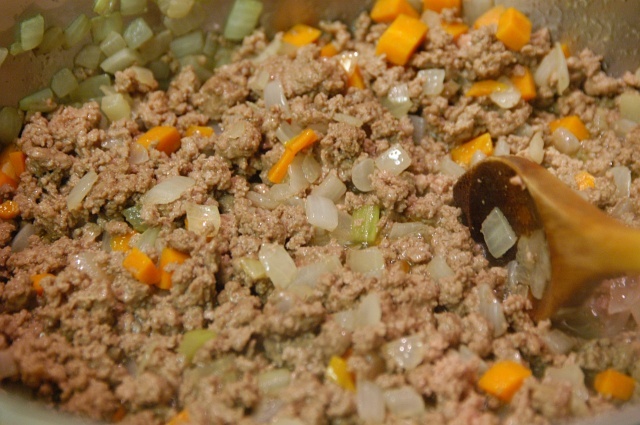 I am using this filling today (without the mash topping) in shortcrust pastry to make the classic Mince & Onion Pie. Lovely!!! Great variations! We have homegrown lamb and mutton that tastes fabulous in Shepherd's Pit. I especially like Yukon Gold potatoes on top. Will be putting corn and/or peas in the pie next time. This recipe looks very legitimate to me, being British. I know there are various family additions and changes to the recipe. Personally, I have never heard of adding sweetcorn, and the prospect I find positively ghastly. In our family, adding a diced red pepper is the norm, and cheddar cheese is mixed into the mashed potatoes, as well as sprinkled on top. We also tend to run a fork across the top in a style similar to freshly ploughed fields. This also aids the crisping of the potatoes. And yes, the addition of Worcestershire Sauce and tomato paste/puree are a must. As to Marmite in the cottage pie, I am intrigued and will definitely try it! In a double batch we went with 1lb ground lamb and 1 lb ground bison (other half prefers it to beef or pork), 4 T of Worchester, 3 cups of fresh spinach, 8 oz of sliced mushrooms, 3 cloves of garlic and a bag of frozen peas. In essence we cooked the garlic with the onions/carrots, followed the recipe as posted then right before adding the potatoes layered the spinach and then peas onto the cooks beef/veg mixture with a lid covering it for 4-5 min. That wilted the spinach and slightly thawed the peas. Then we mixed it all in and continued with the potatoes on top etc. Great stuff... thanks for posting the great recipe and we'll be back for others soon. I've never written on the internet before, but after seeing all the comments from people around the world I just wanted to add my two cents worth. I grew up with shepherd's and cottage pies. Over the years I cheated by using cream of celery soup for the gravy (others like mushroom soup). And I really like some sour cream in my mashed potatoes as it gives it a creamy texture especially when using the cheaper russet potatoes. My favorite vegetable is string beans. Sometimes I put the beans in first, then the meat covered with soup, and then the potatoes. Delicious! I recently asked my sister to make me a shepherd pie, and she said it is supposed to have a bread or roll of sorts. What do you know of this? Left-over meat, veg & gravy topped with buttery mash was first widely known as cottage pie, whatever the meat. By the mid 1800's, cottage & shepherd's (or s' - earliest recipes weren't punctuated!) were used to distinguish between beef and mutton-based pies respectively. While there are as many variants as there are regions and cooks (always the way with good traditional dishes, wherever they're from), the only alternative to hold a separate name is cumberland pie - cottage pie topped with a layer of breadcrumbs. So luke, that may be what your sister was referring to, or the fact that in some areas cottage pies are still traditionally done in trenchers or hollowed out loaves. To be honest, it's meant to be enjoyed - make it however you like it. My preference (& on my restaurant menu) is diced carrot in with the meat, swede (rutabaga?) and a good grating of nutmeg in the buttery mash and gruyere/strong cheddar on top before it goes in the oven. One of my favourites if there's any left at the end of a service... with a good dollop of HP sauce, of course! Enjoy... and keep trying new versions! Stumbled on this site whilst looking how to use Smoked Paprika! Being an ex-Brit and thinking I had all the ingredients, I decided to make this Shepherd's Pie. Followed recipe and found the table of ingredients and actions wonderfully easy to follow as I am now of the age where I need to read a paragraph or recipe at least 10 times over to absorb what's required and I have to keep going back to the recipe every 5 seconds to remind myself of what I am doing......so I just love the table. Will definitely come back to this site. Thank you so much for your whole layout. Some of the other changes that I forgot to post was that I was out of beef stock and had to exchange chicken stock, even though I was using ground beef and also added the last ounce of white wine - all ingredients that aren't really supposed to go together. 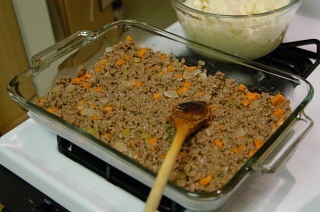 Firstly, Shepard's pie is made with lamb, not beef as its name implies. Cottage pie, is made from beef. Therefore, the two names are not synonymous. In addition, a third meat pie, humble pie is made from the vital organs such as kidney, stomach, heart, etc. A pie made by the poor folks. The implication is that they could not afford the more desirable parts of these animals. They were left with the innards. A shepherd watches over lamb, not cattle, thus the name shepherd's pie. Wasn't this made abundantly clear in the first sentance of the article? Love this recipe and did add milk to potatoes, worcestershire & corn to beef--YUM! Thank you and throughly enjoyed the numerous discussions. I saute small firm mushrooms separately...steam small baby carrots like the ones in a bag in the produce dept. I use "Store Trim" ground beef..it has a little bit of all the different cuts in the meat case...nice blend and usually great flavor. after browning the beef (and not too finely broken up) I pour in some water to the desired sauce level(eyeball this)..and stir in part of an Aujus packet to desired color and judge it by the salt threshold. Then dissolve a little cornstarch in cold water and add in to thicken at boiling temp...I also do this by sight rather than measurements...combine the veggies..oh!...also...I like to put in fine diced celery...so fine that is does not need to be cooked...the oven will cook it just right( a bit firm). I wont go into all the seasonings and such...just these main differences from most the other postings. I use whole milk in the Russetts mash pots...a little prepared horseradish and fresh chives cut into little slivers for nice color. Just want to know who this guy Sheppard is who keeps getting credit for every British person's granny's favourite recipe?